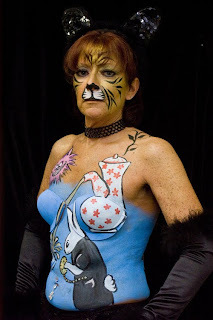 I know that I mentioned in my Wicked Faire post that I was hired last minute to do a full body painting on a cat for a fashion show that was schedule to occur at the Faire. The request was not to make her look like a cat, but to take my cues from the mask she'd be wearing with her ears and tail. I had just over an hour to complete the look, from shoulders to shoes. I did it! The model, Nicole, was great to work with, and apparently was also great at the show, which I unfortunately had to miss. Then again, she's a dancer, so how could she not be great? Those boots are painted on, by the way. 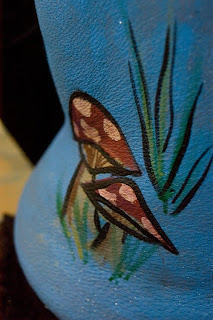 Nicole had on t-strap shoes, but we wanted her to look like she was wearing boots, so I painted them right up her legs. I did my best to mimic the swirls and curls of the mask, as well as the crosshatch pattern and fading that were involved in it. All photos in this post were taken by Chris Bossio. I have had the most amazing time this past week, at the Louisiana Living Arts Festival in New Orleans, otherwise known as LA Fete. LA Fete started in 2006, when I was offered a pot of gumbo. No, seriously. I'm a member of some international face and body art discussion groups, and I mentioned in one that my favorite food was Cajun. Susie Pierce, otherwise known as Susie the Crazy Cajun, told me that if I came down to her hometown of Baton Rouge, she'd make me a pot of gumbo. My response was, "You name the weekend, I'm there," and all of a sudden there were about 30 other artists chiming in with "me too!" We found ourselves picking St. Patrick's Day weekend of 2007, and LA Fete was born. 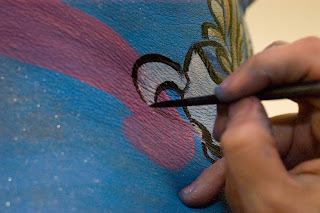 Once a party was planned with so many artists, it was only natural that we intend to practice our art, and that morphed into scheduled classes and workshops. So once a year, for 4 days in March, I go down to New Orleans for LA Fete. I take classes, jam with my friends, face and body paint, and practice my henna. 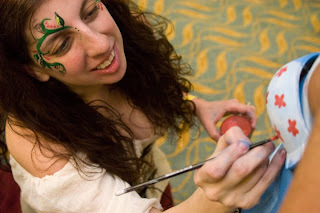 We attend the New Orleans St. Paddy's Day parade, take an afternoon to face paint at the Audubon Zoo and donate the proceeds to charity, and body paint models for a show at a French Quarter club. On Thursday night, we had a zombie crawl, and I got to become a tourist attraction in my own right. I'm waiting to see photos of myself show up on Facebook or Google. My friend Z painted me, and I painted other friends Dot Com the clown and Liz Alaniz. This year, for the first time, my husband Eric came with me. After the Fete was over, we stayed an extra day and went to the aquarium. We're finally home and exhausted, but it was worth it! Nowhere else do I get an experience like that, working alongside the masters and feeding off of each others' creativity. 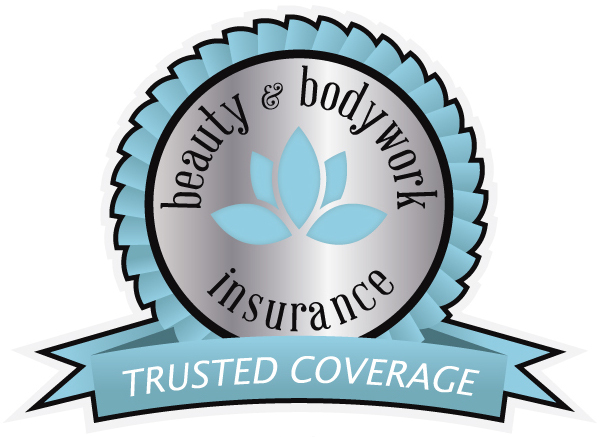 My clients will benefit from it, too. Every time I come back from LA Fete, my skills are vastly improved. I can't wait to try them out this weekend! I painted yesterday at the Norouz Bazar, a Persian Festival at the La Quinta Hotel in Secaucus, NJ. This is my second year in a row at this event; I have been hired both times by Hirbod Azmi, a Financial Services Representative with Met Life to draw attention to their table. Draw attention I did! With a background of dance-inducing Middle Eastern music and the smells of amazing Iranian food, I painted and painted and painted. In fact, while I was still in the midst of setting up I had two kids, a brother and sister, waiting for me! I recognized them right away as two I'd painted last year as well. I had hardly any time to take photos, painting nonstop for three and a half hours, but I did have to get a shot of this one, my first ever request for a full-face penguin. Personally, I think I need to look at more penguin photos and practice this, but he was really happy! And I do say that I love being challenged, so trying a penguin was fun. I also stopped momentarily to take a photo of these two, a butterfly and a frog. They were just too cute together. It was a crazy and fun event, kids crowding around me, the hustle and bustle and movement, and the neverending line. I felt bad having to turn people away at the end while I was packing up, but I had to get to rehearsal for my show. We go up in May. Yup, I'm in theater too! If you're in or near Bergen County, you should come see us. Yesterday, though, the show had to wait a bit. The smells were just too good, so I stopped at a table to get some amazing chicken over rice with a grilled tomato, and some pitas with a wonderful Iranian version of baba ganoush. Leftovers for lunch today! I was hired to paint at a birthday party this evening, only it wasn't a children's party. Some couples were getting together for the adults' birthdays, and wanted to keep the kids entertained. I'd painted these beautiful girls before, at the McFaul Environmental Center in Wyckoff, when I was there for Bergen County's annual Cabbage Night Festival. Their mom showed me a photo from that day, and I recognized my work instantly. Tonight, mom had me get there a little early so I could paint up the sisters before the others arrived. The younger went first, a beautiful butterfly who informed me that her favorite color was purple. Her older sister decided on a puppy. Later in the party, though, the puppy was washed off in favor of a leopard to mach her shirt. I also got to do a whole garden full of flowers. The girls' teacher, who was there to watch them for a while, and another older relative got them on their fingers; the smaller girls and one mom got them on their hands. There were also princess swirls, a vine with butterflies, and a very cute penguin to match one young man's shirt. I love painting for such nice families! An Alice in Wonderland party! Now, you can tell from my prior posts that I've got Alice on the brain. But there's a new development. Of course I can paint your face (or the faces of your kids and their friends) as the inhabitants of Wonderland - it's great to go to the movie painted and get some attention! See this post. But now, I can also tattoo you with glitter or ink in Wonderland-themed designs! I can assure you, I'm the first person in NJ to get these terrific temporary tattoo stencils. They were custom-made by a wonderful stencil maker in North Carolina, and aren't available anywhere else! I've got the Cheshire Cat, the Mad Hatter's hat (hey, that rhymes! 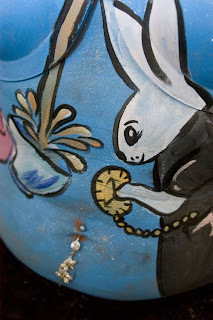 ), Alice herself, one of the cards, the White Rabbit, and of course the Caterpillar. Contact me ASAP to check my availability for your next part or excursion to the movie theater! And while I won't be here in NJ for St. Paddy's, there's no reason why you shouldn't throw a pre-or-post-Paddy's party! 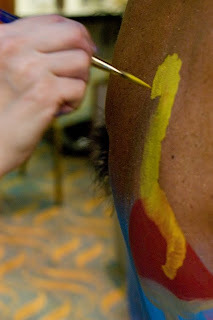 I'll be in New Orleans from March 16-23, at a face and body painting seminar and event. There will be lots of photos from that, I assure you! But you won't want to miss out on having me at your event anyway, since I've also got brand-new St. Paddy's stencils, also from North Carolina, and also unavailable elsewhere. You'll be the coolest kid on your block when sporting these designs! And in honor of St. Patrick's Day, I've got my lucky horseshoe and four-leaf clover all ready to go! I used two shades of green and some gold on this one. Much like face painting, glitter tattoos are a lot easier to do on someone else than myself! Anyway, hope you like these. Let me know if you want some too! Yesterday, I went with friends to the Orchid Show at the NY Botanical Gardens in the Bronx. I brought both of my cameras - the digital one Eric got me last year for Chanukah, and my very old Fujica that takes 35mm print film and is 100% manual. I don't have my prints back yet, I actually have not yet dropped off the film for developing, but I've got the digital photos, of course, so here are a few. 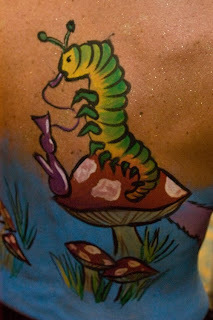 In my last post, I showed a bit of the body painting I did on Toni at Wicked Faire. Well, yesterday I received a CD of photos from one of the professional photographers, and my biggest problem has been figuring out which ones to post because they're all so great! All photos in this post were taken by Phillip Makselan. Toni met me in the Green Room with her bra cups already on, and while we were waiting to be called to the stage, I laid down the blue base and the glitter spray. The blue is Fantasy Worldwide cream; it's really easy to wear and I knew she'd be comfortable in it. Last year, as we found out, the chocolate I used on her corset tightened as it dried and pinched her. No issues like that with the creams! The glitter spray is also skin-safe, made by Mehron, a theater makeup company. This photo (above) was right after we got on stage. You can't tell, I don't think, but I was already exhausted. I spent the entire day and night in Renaissance Faire garb, and that corset is tight! I started "work" at noon. 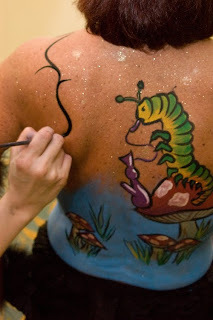 Plus, I had the surprise full-body painting earlier in the day, and other paintings throughout, so by 8:15 p.m. when this photo was taken, I was ready to lie down (and the day ended at 2 a.m.!). I started with the Cheshire cat's face because it was the very first element I thought of when I knew I wanted to do this design. What's Wonderland without the cat? Once I blocked out that shape, though, I was all over the place, painting everywhere at once. We had a pretty good audience. It was smallish, but constant as some people went to see other shows, and then come back, and others passing in the hall poked their heads in to see what was up and ended up either coming in to sit down, or hanging out in the doorway. On the fly, I realized the teapot really should have red flowers, even though it wouldn't quite be a "set" with the teacup. 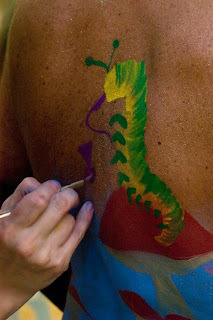 Body painting is really physical, for both the artist and the model. I kept asking her to turn, raise and lower her arms, and take different positions. At the same time, I was often bending over and around her. Or even crouching down to paint upwards. I did mostly stick to the front first. At this point, I was actually down on my knees to paint, just to make it easier. 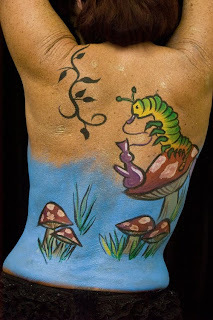 For the back, I was all about the mushrooms and caterpillar. Together with the Cheshire cat, the caterpillar is my other favorite character of Wonderland. And what's the caterpillar without his hookah? Once all the big colors were blocked in, I was able to add details and outlining, since I was going for a cartoonish sort of look. To tie the back and front together, I used a vine that traveled over Toni's shoulder. The funny thing about that vine... for Valentine's Day, my husband bought me a 2010 leatherbound edition of Alice's Adventures in Wonderland and Other Stories, in hot pink, to inspire me for this painting. Around the outside of the cover is a trellis of black vines that - last minute, did inspire me. This is the finished back. And a few nifty detail shots for you. And all done in just about an hour!